Even though it is not a federal holiday, patriotic citizens still celebrate Flag Day in honor of Old Glory—the nick name for our US flag. Each year on June 14th, Americans glorify the birthday of their stars and stripes clad banner, which took its place in history on June 14th, 1777. It was at this time the Continental Congress approved the new flag design, and set into action that this flag would be a symbol of the new Nation. The nation in question? The one we know as the United States of America of course! In 1861, Hartford, Connecticut was the first location to hoist the American flag in an actual Flag Day celebration. This was also the first summer we were fighting the civil war. However, on June 14th, 1877, the one hundred year (centennial) anniversary of the the original flag approval, the first national acknowledgement occurred. In 1916, President Woodrow Wilson recommended that an official nationwide measure to honor June 14th as Flag Day was announced. But, it wasn't until 1949 that Congress confirm the date as a permanent holiday. "...the 14th of June of each year is hereby designated as Flag Day..."
It was President Harry Truman who signed the measure into law. In 1861, Hartford, Connecticut was the first location to hoist the American flag in an actual Flag Day celebration. Six white and seven red alternating stripes, making Thirteen in all. Each stripe is positioned horizontally on top of the other (the first stripe at the top must be red). White five-point stars placed on a field of blue. The field of blue has to be placed in the top left corner closest to the flagpole. The field of blue also has to extend to the bottom of the fourth red stripe from the top. 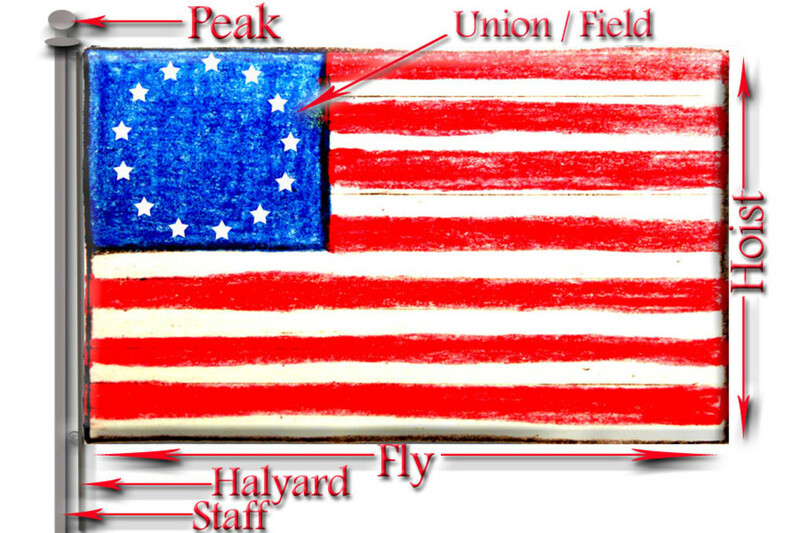 The number of stars must indicate the equal number of states that are in the union at the time the flag is created. When the Revolutionary War was in full force, there were many folks who were extremely patriotic that made flags during that same time. 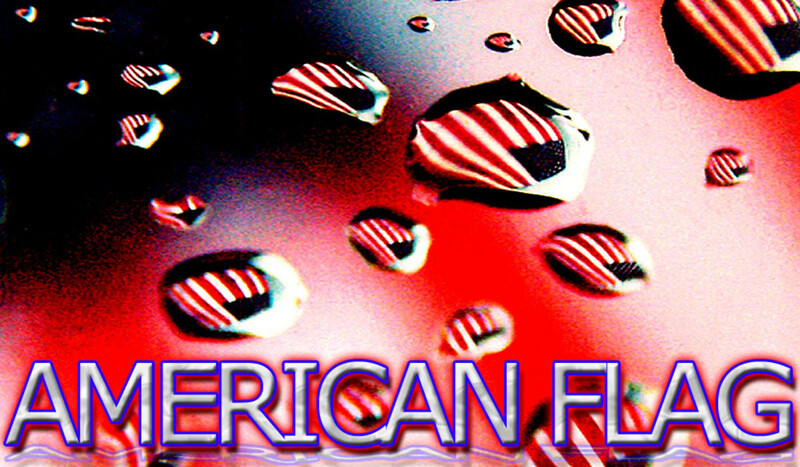 Betsy Ross, who is the most recognized name, made flags for about fifty years. But, there is no real proof that she was the maker of the first historical American flag. 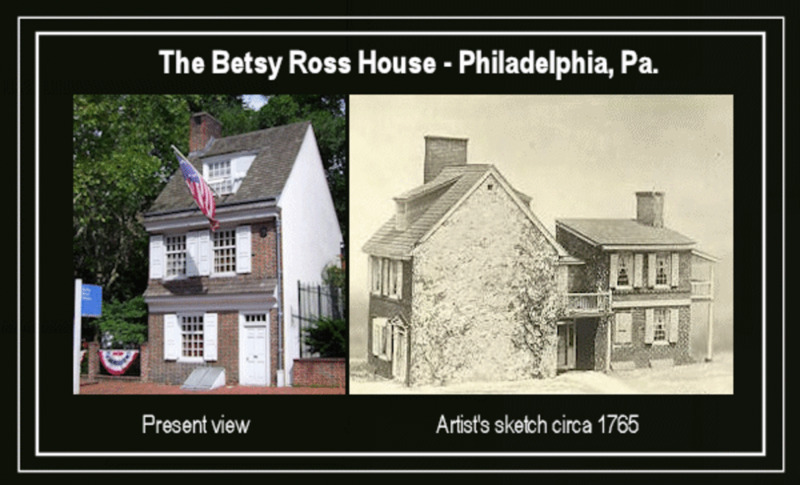 Records show that Betsy worked for the Pennsylvania State Navy, where she made flags in 1777, but the "Betsy Ross Flag" (most notably recognized by the arrangement of stars in a circle on the blue field) wasn't around until the beginning of the 1790s. 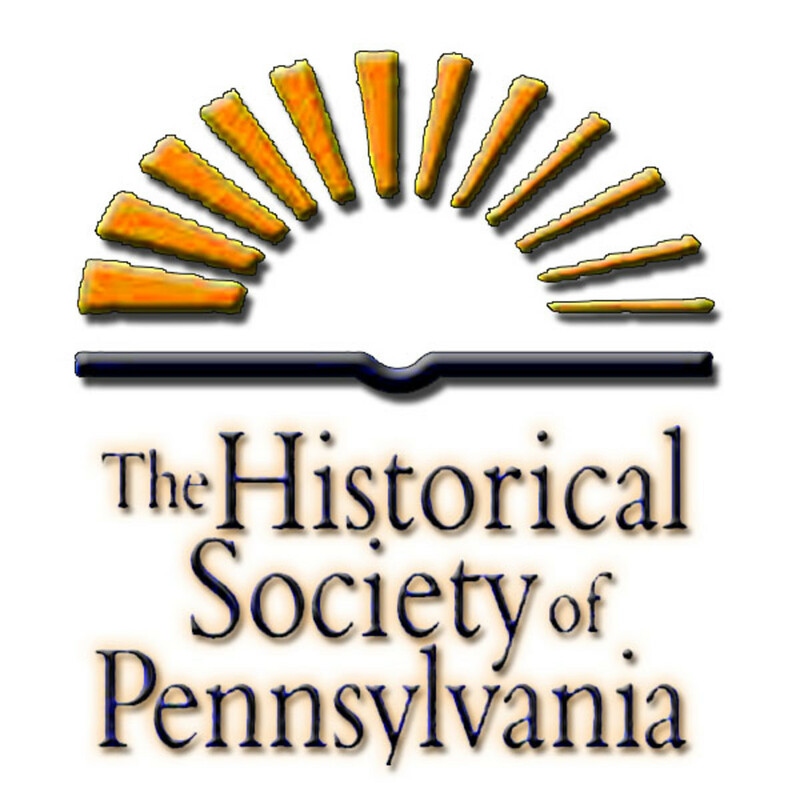 According to American History records, it wasn't until Betsy's Grandson, William Canby, presented a speech in front of the Historical Society of Pennsylvania in 1870, that things turned to Betsy's favor. He essentially stated, that when he was a little boy he witnessed a group of people, claiming they were a committee of Congress, who essentially asked Betsy Ross to make a flag from a rough drawing the group presented. He then went on to say, that among the committee was General Washington (who later became the President of the United States when he was inaugurated in 1789, and then again in 1792). 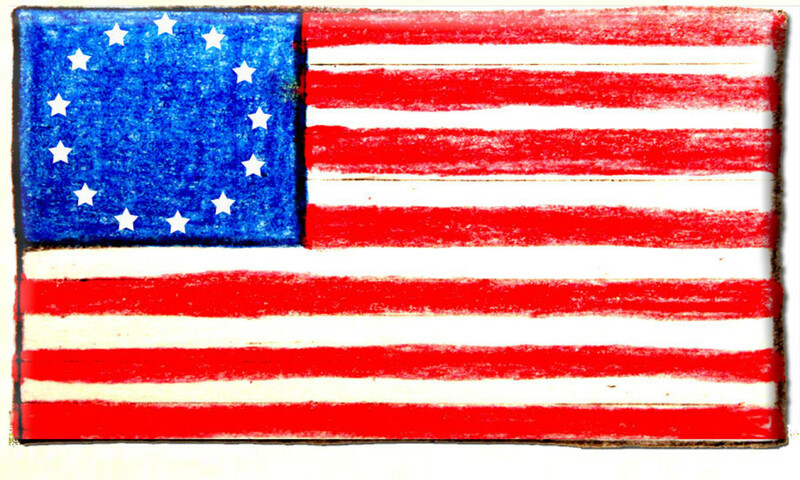 Canby continued, saying that the flag drawing they gave to Betsy was redrawn by General Washington in the back room of Betsy's home, where Betsy's suggestions were implemented. He swore that the date of this event was (prior to the signing of the Declaration of Independence) the same as that of Washington's visit to Congress from New York in June, 1776. History would indicate that Canby's presentation to the Historical society carried enough believability, that history calls on Betsy Ross as the maker of the first true American flag. 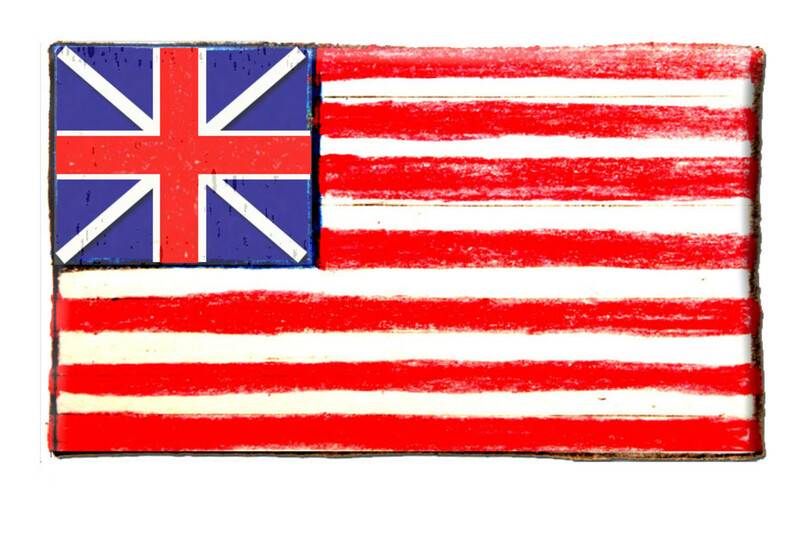 The first flag that had a slight similarity to our well known modern stars and stripes was the Grand Union Flag. Just like Betsy Ross's famous flag, this design had thirteen alternating red and white stripes that were representative of the then Thirteen Colonies. However, very unlike Betsy's flag, this one had a blue field in the upper left-hand corner (where we now see our stars on a field of blue) that had the red cross of St. George of England, along with the white cross of St. Andrew of Scotland centered there. This was the flag of "the revolution" and was put to use quite often. It was the first flag to be flown by the Colonial Fleet, and it was the first "unofficial" national flag of July 4, 1776, Independence Day. The Grand Union Flag continued be be used as the unofficial flag and ensign of the Navy until June 14, 1777—the date in which the stars and stripes would be authorized by the Continental Congress. When the final separation between Great Britain and the American Colonies occurred, the British Union was removed from the blue field of our flag, which was then replaced by white stars to represent each state of the union. As the concepts surrounding the successful progress of the colonies grew, so did the number of states within it. In January of 1794, a resolution was passed that would mandate the addition of one star and one stripe for each newly admitted state. Thus our flag was given two extra stars; one for Kentucky, and the other for Vermont. This brought the stars and stripes count to fifteen each, which was actually no big deal, but that would change when a little thought was put into this idea. 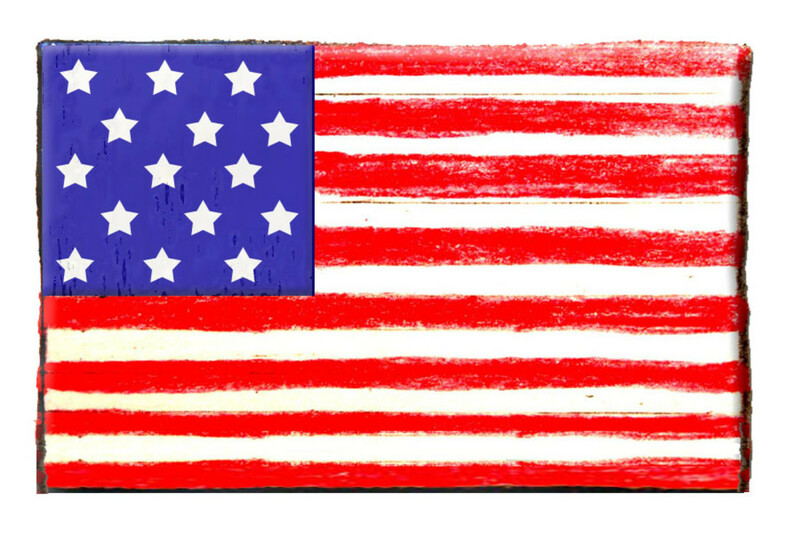 This flag is Francis Scott Key's muse for writing "The Star Spangled Banner"
When a Navy officer realized that adding a new stripe for every new state would, in time, make the flag far too large to manage, he came up with an idea and presented it to Congress. His idea was to return the flag to its original thirteen stripes as a nod to the original Thirteen Colonies. Then, only a new star would be added to the field of blue in representation of the new state joining the union. 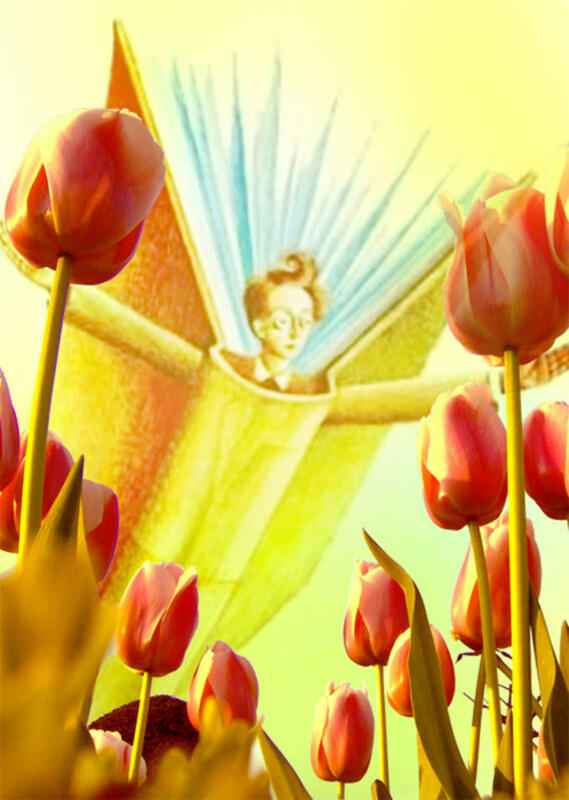 This would assure that the growth of the Nation, (as well as the new state) was respectfully symbolized. President Monroe, on April 4, 1818 approved this plan; and so, the stars and stripes remain thirteen stripes in hoist, and currently, fifty stars strong. The height of the flagpole you will be using determines the size of the flag. The only real rule is that the flag must be the right proportion for the pole being used. For other recommended flag sizes see chart at right. Two people stand facing each other and hold the flag lengthwise between them. Then fold it again into a quarter length. Keep the flag taunt and squared at the folds. Start to fold the flag in triangle shapes, beginning from the striped end. It is really important that the flag is tight and free of air pockets when you get to the field of starts. Tuck the end into the final fold opening. 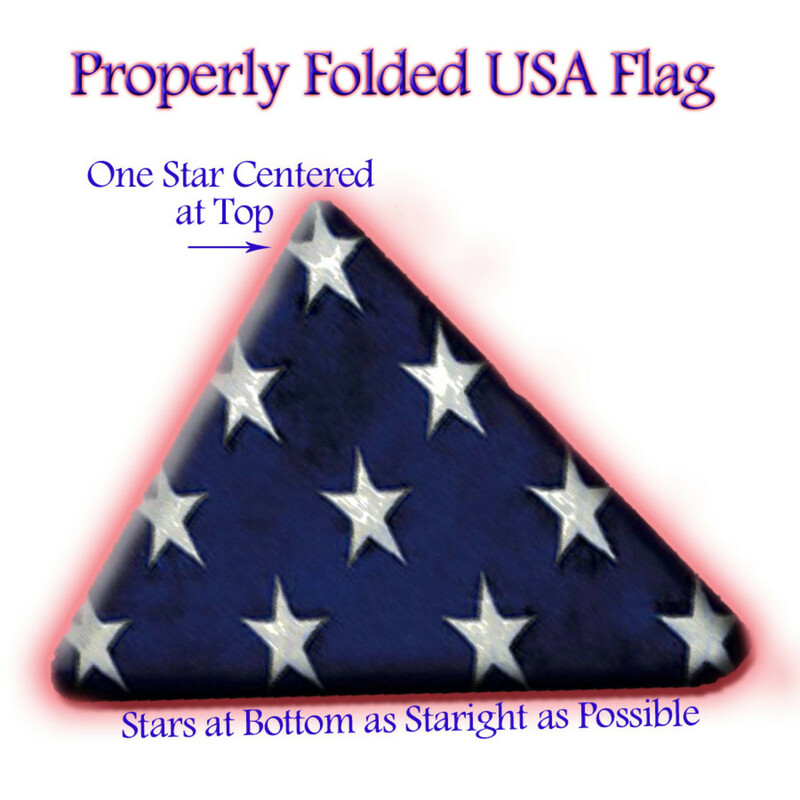 You know you have done a great job folding your American flag when there is a single star situated at the top point of the triangle, and the row of stars at the bottom of the triangle is as straight as possible. Now go show your family and friends how to fold the flag! It's Cheap and Easy to Make Your Own Sock Puppets! Learn how to quickly, easily, and very cheaply make a Sock Puppet at home. The video takes you through an easy step by step process that is so much fun, everyone will want to make their own Sock Puppet! Great for Playing, fundraising, and as gifts! Why is the American Flag Red, White, and Blue? Comments "American Flags for Kids"
My mother would hang a flag out every Memorial Day to honor those who served (many in our own family) our country. You have reminded me of this and I believe I am going to buy a flag to hang on important holidays like Memorial Day. Your post is wonderful! Denise~ How cool that trip must have been! FL is a great sunny place with a ton of interesting things to see. But, the AF museum is one place I still have to visit. I spent the majority of my military career either in Texas, or on overseas specialty assignments. I think it is honorable that you hold such high regard for our flag! Thanks for sharing your story! I hope you had a blast with your daughter (can't wait to have another one of your offspring hanging out with us on HubPages)! You sure do make some spectacular babies! K9-I didn't realize your connection with the Air Force...I just returned from FL and one of the things I did on my vaca. was to tour the Air Force museum in Fort Walton Beach with my youngest daughter (who wants to join) and her family. I have always loved planes and have always regretted not learning to fly when I was younger. I really enjoyed the museum. Denise~ Thank you, thank you, thank you! Flag facts mean the world to me. As a veteran of the US Air Force I have such high regard for our flag and how it got to where it is today. Teaching its history to kids feels important to me. I sure appreciate your kind remarks! Cara~ It means so much when you approve of a hub! It really thrills me to hear that you think the hub would work well in a classroom setting! My heart always speeds up a beat when I can teach something worth while to children! Thanks Cara! 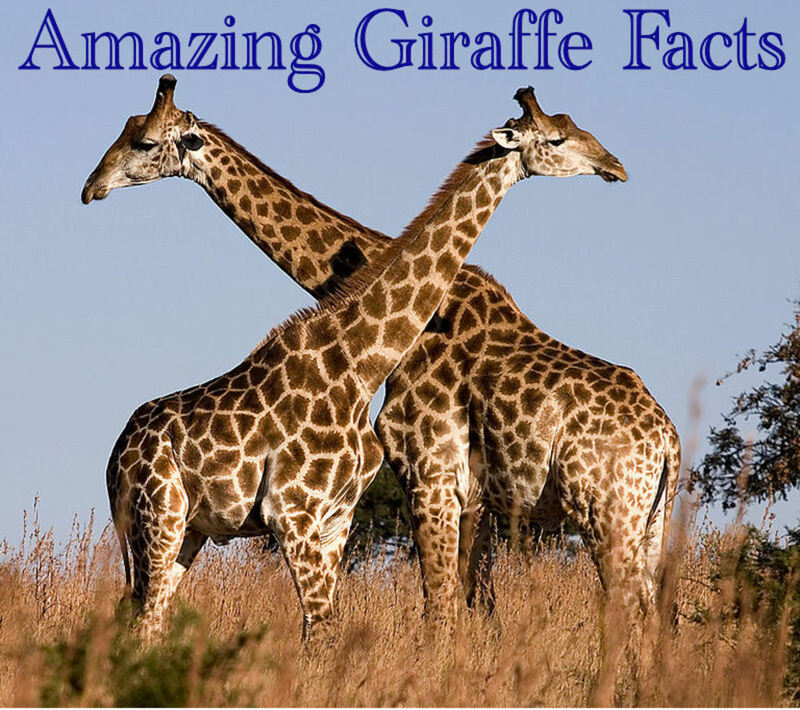 This is a fabulous source of information! 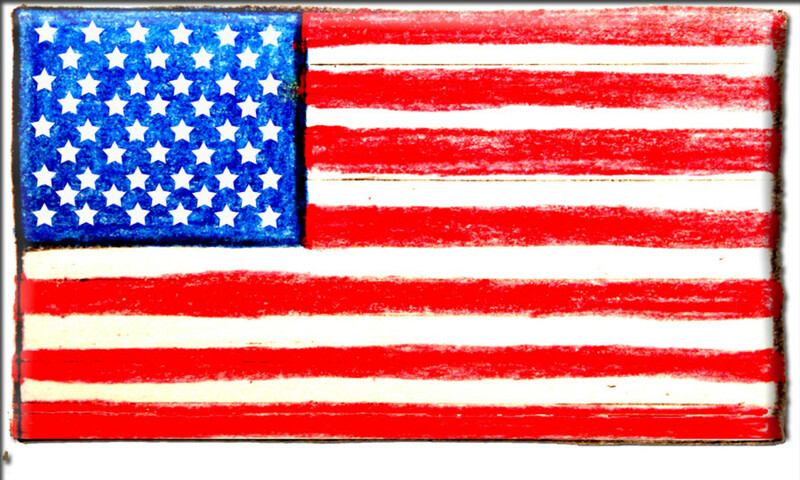 It is a perfect addition to any classroom's study on the American flag or US history in general. Thanks for this fact packed hub! 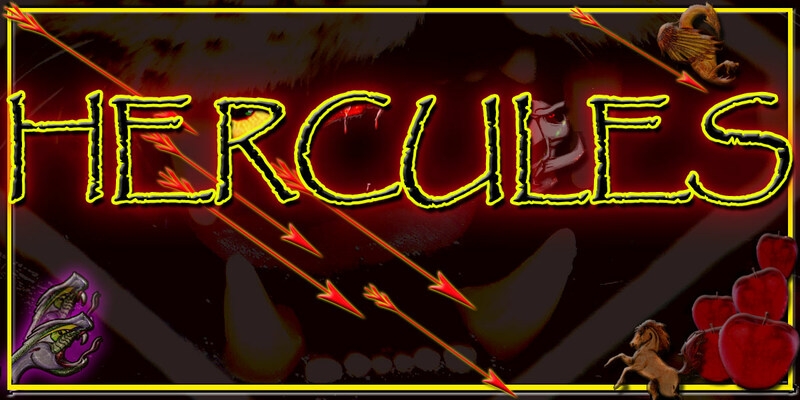 thecvercat~ I sure appreciate that you stopped by for a look at flags for kids! I found there is a lot of rules and regulation surrounding our American Flag! Glad you learned a little something about flagpoles! pstraubie48~ Thank you so much for your inspiring comments. I can tell you are a proud daughter of an honorable service man; which is a rare and beautiful thing. You are right, even with its flaws, our country is a wonderful place to live and one worth striving to keep. I appreciate that you shared your thoughts here. I liked all the tidbits of info about different styles of flags, flag sizes, and flag hoists. I guess I never really thought about the size of the flag versus the flagpole! Voted up and useful. Thank you for writing this. The American flag is to me a source of pride and a symbol of our struggle to survive odds that may have seemed insurmountable. My Father fought in many wars for our country and would raise the flag each day in front of our home until he was too feeble to do so at age 93. Last year, my last full year of teaching, our end of the year program was centered around the USA ...our songs and the décor reflected our theme. The huge flag my Mother received at my Father's memorial service was the backdrop. Each child was given a flag to wave and to keep as they left that day. It seems too many are afraid to say they are proud to be an American...Our country is not without flaws but it is a unique place to live for so many reasons and my pride has not been diminished at all. If I am not part of the solution to making this country better, then I am part of the problem. I seem to have gotten off topic...sorry...but this is a very important topic to me and you have brought it to ur attention. Wonderful hub India. It would be a great addition to any teacher's lesson plan on US flag history. Voted up and shared. 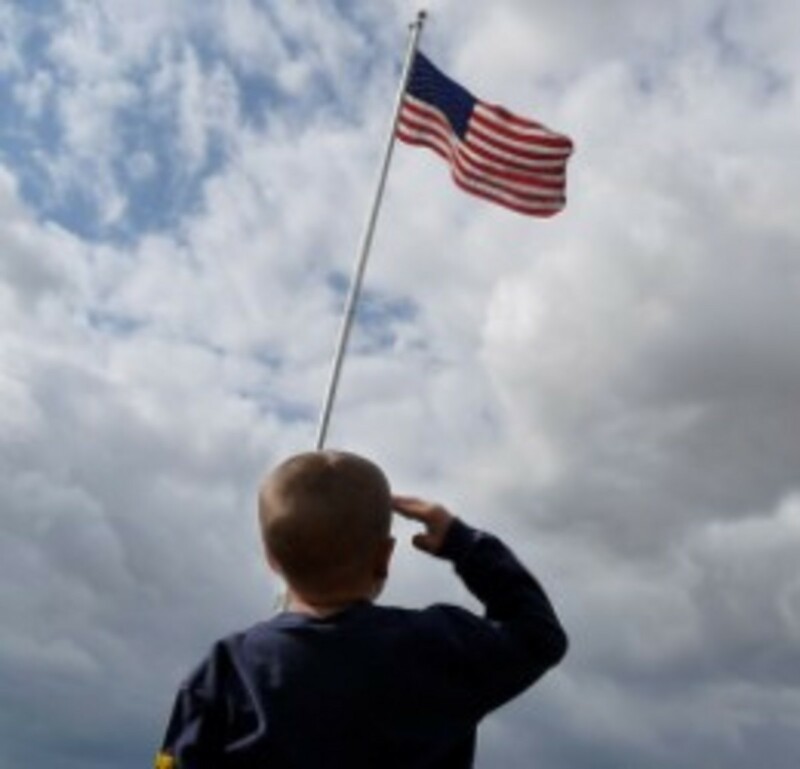 A fantastic guide for teaching kids about the American flag! You even taught me a few things about our flag's history. Job well done - voted up, useful, and interesting! This is a wonderful Hub that should be required reading in all schools throughout our country. Your illustrations are perfect, and your quiz is a great added touch. Thanks so much for publishing this article.